The boy finally had his last day of preschool as well last Wednesday. He was less than thrilled with the fact that his sister & I were already finished with school, but he did want to go for bounce house day on the last day. He had sausage & cheese kebabs, with assorted melon and tortillas & roasted red pepper cream cheese (it's poking out under the kebabs). 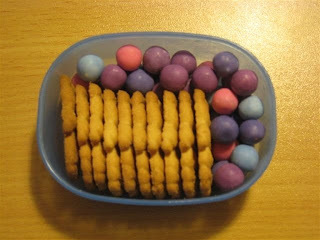 For a treat, he had some mini teddy graham type cookies and some yogos. Silly boy ate the main dish and left the treats! I can't tell you how much I've enjoyed your blog. I'm just beginning to do this for my kindergartner. 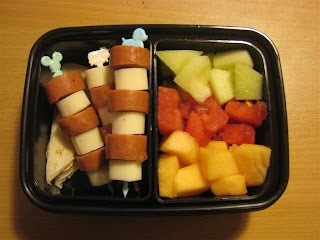 A friend tipped me off about a website that has extremely inexpensive bento boxes and supplies. I just ordered a slew of them. The site's address is ichibankanusa.com. You should check it out; many of the children's boxes are just a dollar or two.